Diabetes mellitus — a very common and dangerous disease. No secret treatment diet and various drugs gives the desired result. But for people with type II diabetes there is a unique method of treatment — metabolic surgery. This method of treatment used in Turkey for nearly 15 years, demonstrating excellent results — the positive outcome of the treatment is observed in more than 90% of cases. A pioneer in this field is Dr. Alper Celik, who practices at the clinic Metabolik Cerrahi. This famous surgeon looks back on 1200 such operations. 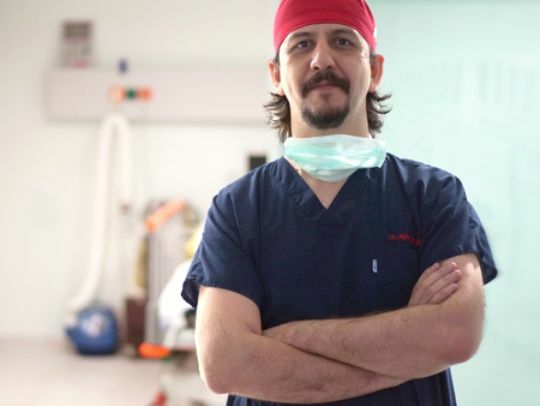 According to the American medical center of excellence, Alper Celik recognized as the best surgeon in the field of bariatric and metabolic surgery. A «bouquet» of problems — diabetes, high blood pressure, overweight, high cholesterol — called metabolic syndrome. Treatment of the syndrome with surgery is called metabolic surgery. Such operations are highly reliable, they are satisfied and closed minimally invasive manner, so that the patient already 2-3 weeks can return to normal life. The most common way to practice — it ileal interposition (change of location of the intestine parts). As a result of this operation are switched off resistance hormones and hormones are activated sensitivity. Operation stabilizes blood pressure and blood glucose levels, and also relieves the load on the liver and kidneys, protecting organs from damage. Moreover, after the operation it is possible to control body weight. In patients with diabetes mellitus type II, there is a sufficient amount of insulin, which is released by cells of the pancreas. The problem is that the muscles do not use it at the cell level. While as insulin for diabetes Itipa catastrophically low level, so in this case the operation does not give metabolic any changes. Often, in diabetes type II appears a condition called «insulin resistance.» But such an operation just contributes to the suppression of hormones of the gastrointestinal tract, which are resistant to insulin. After surgery, the insulin begins at the cellular level is better absorbed. As a result of this operation occurs in normalization of blood sugar level. The period of remission and return to a full life after such surgery depends on the stage of diabetes and the general condition of the patient. Statistics pleases: normal lifestyle recovery by as much as 70-98% for up to 30 years! A decisive role is played here by supply of insulin in the body of the patient, as well as its activity. Thus, the benefits of metabolic surgery without a doubt! Patients do not need to worry about the safety of operations of this kind, because, firstly, the cut and the connection portions of the intestine is performed using disposable equipment. And, secondly, the use during surgery medical instruments is a product of modern technology. Metabolic Surgery not only get rid of diabetes, but also give the opportunity to enjoy life again! Anyone who has observed the jumps in blood sugar levels, doctors strongly advised to monitor its level — this helps the meter. It is worth noting that there are natural herbal remedies that normalize blood sugar levels, improves carbohydrate metabolism and reduce the risk of developing diabetes. These include Olidzhim (INULIN + Gymnema) Diabefit and others. Before taking herbal remedies should consult a doctor.